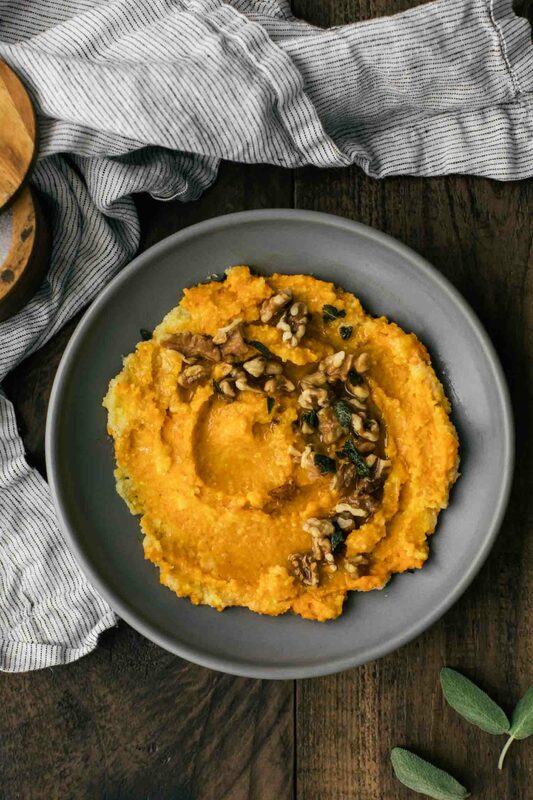 Roasted Carrot Polenta with Sage and Walnuts | Naturally. A creamy and delicious carrot polenta made with bulk-bin polenta and roasted carrots/garlic that have been pureed. Add water to a medium pot and bring to a boil. Reduce to a simmer then pour the polenta, whisking constantly, until combined. Whisk in the salt, cover and let simmer, stirring occasionally, for 20 to 30 minutes (see note). If the polenta has thickened too much, add a bit more liquid and reduce the heat to the lowest setting (or burner). Once the polenta has thickened and the taste has mellowed, remove from heat and add in the heavy cream ad carrot puree. Taste and adjust seasoning as desired. In a small skillet, heat to medium and add the ghee. Once the ghee is hot, add the sage leaves and let fry until crisp, 1 to 2 minutes per side. Remove and place on a dry towel. Divide the polenta into two bowls and top with the toasted walnuts, fried sage, and a drizzle of olive oil if desired. Tips & Tricks: This polenta is perfect as a base for other roasted vegetables, legumes, and fried eggs. For the polenta, I cook it over the lowest setting possible. Cooking polenta for a longer time makes for a better, richer flavor. There’s a few different directions you can take with this carrot polenta. It’s fairly simple because with the carrot components, it’s a fairly hands-off meal. However, you can switch the flavorings and toppings to make it a completely different meal every time. 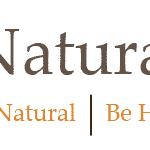 Vegan: Leave out the heavy cream or make a walnut-cream sauce that you could use in place of the dairy. Use olive oil in place of the ghee. Flavor: Mix in harissa or romesco (two of my favorites) or try different herbs/spices. Toppings: This polenta works really well with garlicky greens or spiced chickpeas. 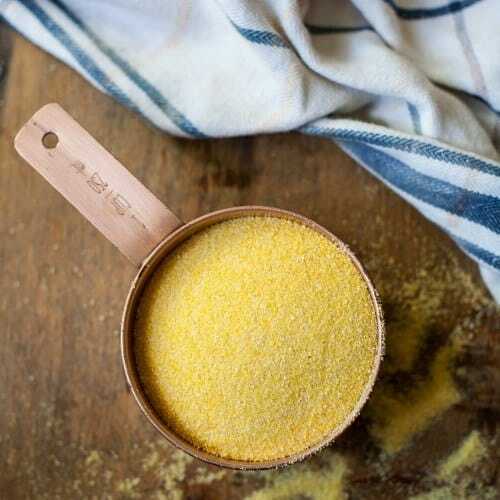 Polenta is one of the items that is always in my pantry. It makes for a perfect vegetable base, can be used in different leftover ways, and is light on effort to prepare. As mentioned in the recipe, I prefer this method for cooking polenta and my current favorite polenta is this brand. another great idea, that is, carrot polenta, thank you for this, great tips too about flavor tweaks, I like your red harissa too! Yup! I think cakes would work well!